Recent media reports claim that sales of digital compacts have been hit hard by the increasing popularity of the smartphone, and, as a result, several camera manufacturers have ceased production of low-end models. With their convenience and connectivity along with the emergence of social media sites it’s not difficult to see why a smartphone would be more attractive for certain applications than a purpose-designed compact camera. Mobile phones are so commonplace now that it’s far easier to accept them than a camera in many social situations, or perhaps it’s more accurate to say it’s easier to overlook a smartphone as a camera. Like some of the more recent up-market rivals, the camera module of Nokia Lumia 1020 offers control over exposure, shutter speed (1/16,000 to 4 sec), sensitivity (ISO 100-3200), white balance and auto-focus. The technical specs are impressive and include a 41-Mpix (38-Mpix effective) 1/1.5-inch type BSI CMOS sensor, which at 8.8 x 6.6 mm is considerably larger than rival handsets (though still slightly smaller than the company’s 808 PureView with its 1/1.2-inch sensor. Stills output includes a native 38-Mpix JPEG file, as well as a simultaneous oversampled 5-Mpix JPEG for more convenient sharing. Although the lens a six-element 26mm equivalent f2.2 stabilized AF Zeiss prime with a minimum focus distance of 5.9” (15 cm), the Nokia 1020 has a digital zoom option. This crops the native 38-Mpix image but doesn’t affect the size of oversampled 5-Mpix files, hence the ‘lossless zoom’ moniker. 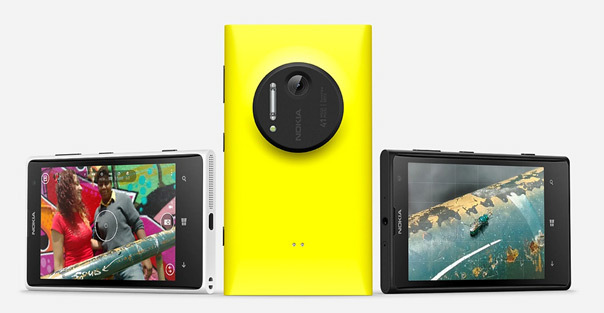 Stills are only a part of the attraction of course, the Lumia 1020 also records video at full HD 1080p at 30 fps using MP4/H.264 formats. All this accessible via a 4.5-inch WXGA (1,280 x 768 pixel) AMOLED panel with a toughened Gorilla Glass 3 cover and housed a monobloc polycarbonate shell weighing 4.8 oz (158 g) and measuring a not inconsiderable 5.1 x 2.8 x 0.4” (130.4 x 71.4 x 10.4 mm). With a DxOMark sensor score of 41 points the Nokia 1020 has a global ranking of 222 in our database (of 242 cameras). With the exception of the low-light capabilities perhaps, each of the metric scores are impressive; color depth is 20.2 bits, while dynamic range is an expansive 10.4 Ev. Low-light ISO, however, is just 135 ISO. 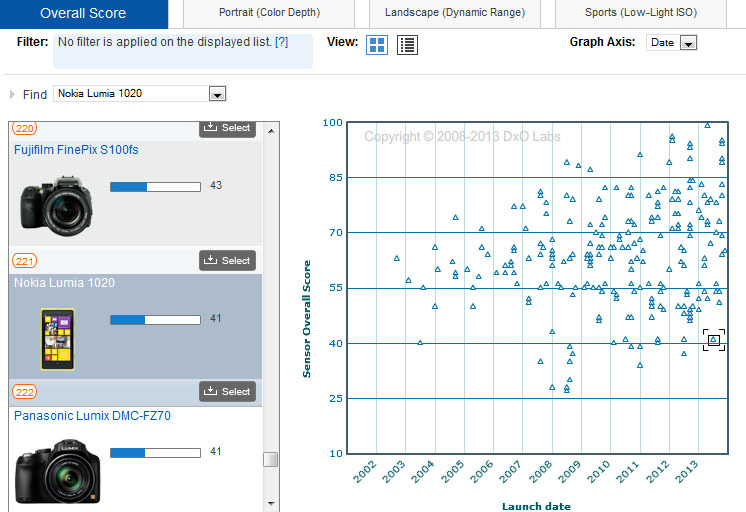 Given the physical size and pixel density of the sensor, this is an interesting debut to our database. Compared with one of the more recent compact models in our database – the high-end ‘super-zoom’ Panasonic DMC-FZ70 sensor, the Nokia sensor performs very well indeed. While the Nokia can boast of a +½ stop increase in color depth over the Panasonic, it can’t quite match that model’s dynamic range or low light capabilities; in both cases the Panasonic has a +1/3 stop advantage. The gap is getting closer! 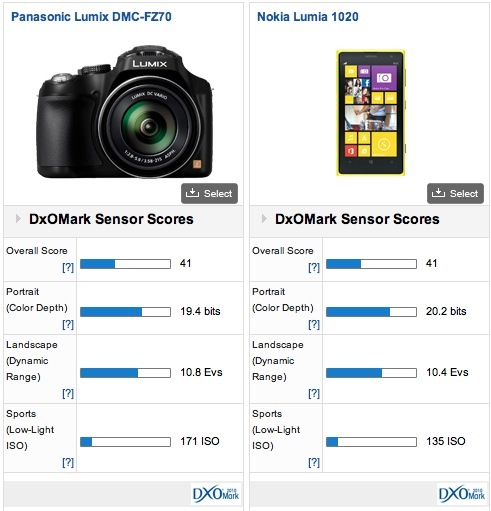 Compared to the 12-Mpix Canon PowerShot S120 and Nikon Coolpix P330, the Nokia, with its much higher pixel density, is around – 1 stop behind in sensor performance. At base ISO the Canon has the equivalent of +2/3 stop improvement over the Nokia in color sensitivity, while the Nikon is slightly less capable but still around +1/2 stop better than the mobile. 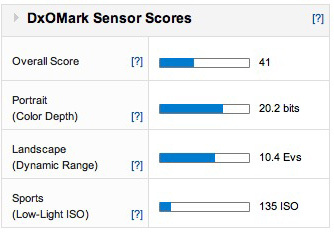 The two compact cameras also have superior dynamic range, with the Canon and Nikon models showing a +1.5 and +1.3 Ev improvement, respectively. In low light the story is pretty much the same, with the Canon having around a +1 stop advantage over the Nokia, while the Nikon has slightly less of an advantage of around +2/3 stop in sensitivity. Looking at the Sony Cyber-shot DSC-RX10 and RX100 II, which share a related 20-Mpix 1-inch type (13.2 x 8.8 mm) sensor, the pattern repeats itself. In this instance the two Sony models, with their larger pixels and lower pixel density, have around +1.5 to +2 stop advantage in sensor performance for any given metric. 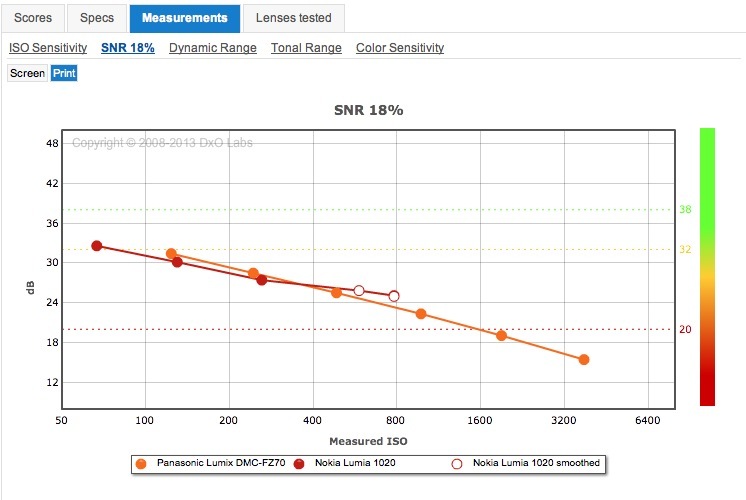 Color sensitivity in the Nokia is around -2 stops less compared to the RX10 and around -1.5 stops against the RX10. Dynamic range and low light capabilities share a similar +2 stops advantage with the Sony compacts, but it’s still quite surprising that the difference isn’t more significant. 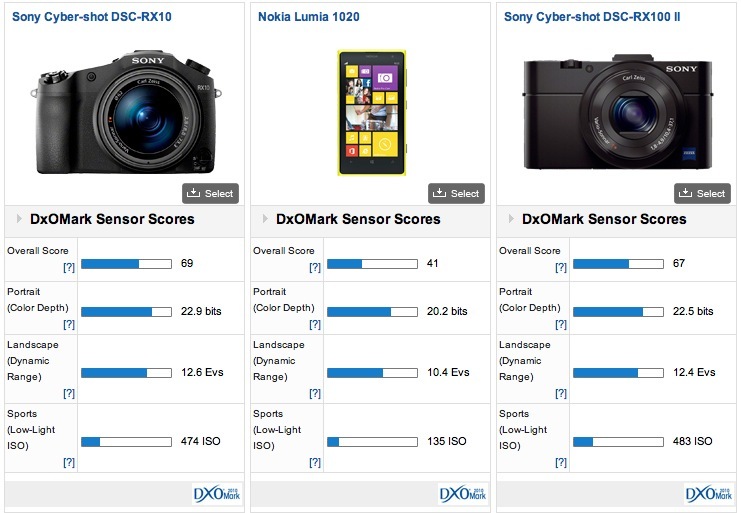 We thought we would compare the Nokia 1020 with the sensor performance data from the Canon EOS 100D and a Nikon D3200 – cameras with significantly larger pixel pitch. 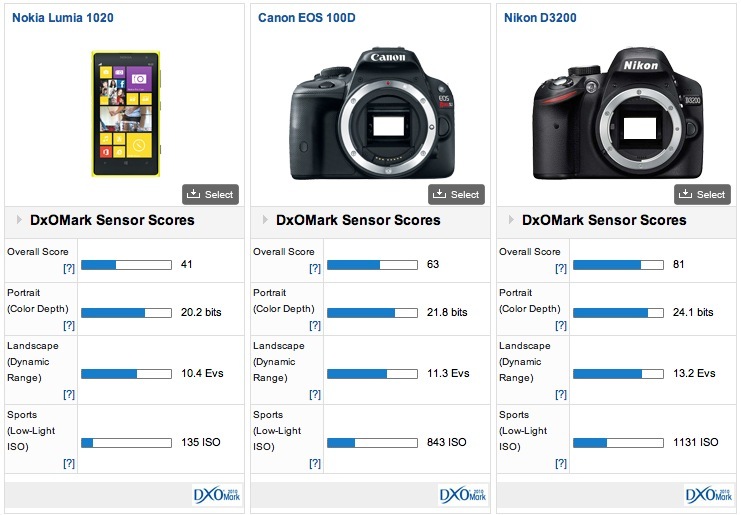 As you would expect the DSLRs are capable of superior performance on the whole but not in every metric. In fact the DSLRs and the Canon in particular has the equivalent of just +1 stop improvement in color sensitivity, though this increases to +2.6 stops with the different sensor in the Nikon. The Canon’s dynamic range at base ISO isn’t that much wider than the Nokia’s either (at around +1 stop), whereas the Nikon’s is almost +3 stops. It’s in low light, unsurprisingly, that the Canon and Nikon show a significant advantage equivalent to +2.66 and +3 stops respectively over the Nokia. Nokia’s use of a relatively large (6.6 x 8.8mm) BSI CMOS sensor in the Lumia 1020 is a contributing factor regarding performance, however, compared to the best in class digital compact cameras, its capabilities are still restricted in low light or when high ISOs are used. It’s also worth noting that we’re not taking lens performance into account in this review, which is clearly an important determiner of image quality. Be that as it may, the fact the sensor performance of the Nokia 1020 is on a par with certain current compact cameras at low ISOs is particularly revealing; whatever your personal feelings are regarding the smartphone, it shows remarkable promise.